Y’all it’s time to talk about this awesome swap again. I was so, so excited months ago when Beth and Angie from Chaotic Goddess Swaps announced this theme. And it was a lot of fun to shop for. My swap partner is Mary Britni. She’s a new blogger from Virginia, blogging over at Life with Mary Britni. I always like to get a newer blogger; it’s fun to spoil them extra just so they have a good time with the swap. (Janna did that for me years ago with the Pinkastic swap; I felt so loved.) Mary Britni is a super cool chick. I’m pretty sure we’d hang out together a lot if she lived in Columbia. Here’s a sneak peak of what I sent her, but you’ll have to wait for her full reveal post to see the details. Her favorite color is pink so I tried to please. So what did she send me? 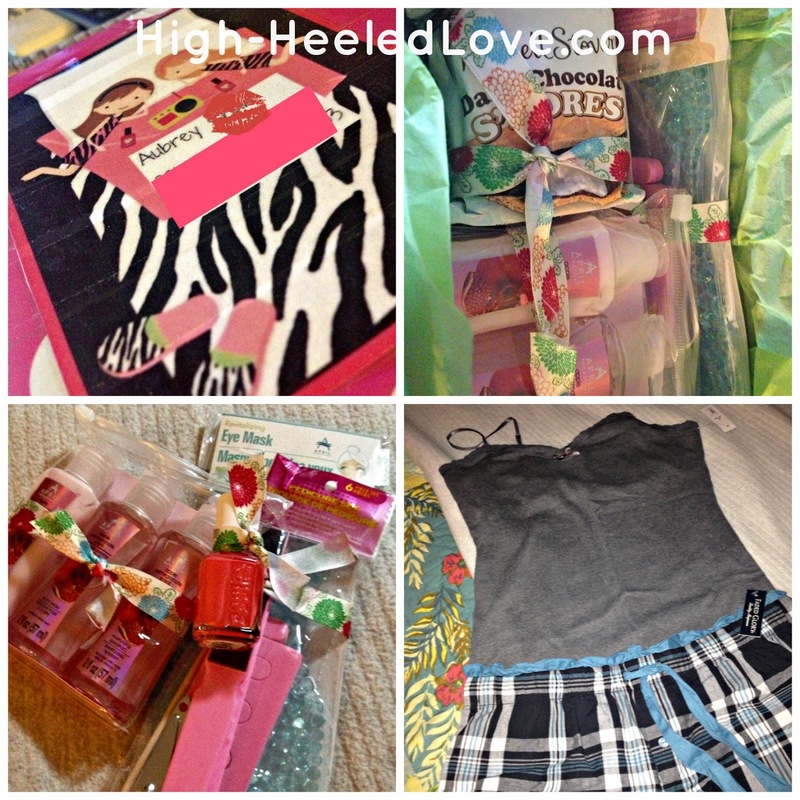 Upper Left – How cute is the shipping label that she made for my package? It was also wrapped in pink polka wrapping paper. Upper Right – The first thing I saw was CHOCOLATE! I put it straight in the freezer since the package on my porch for a while before I got home. Lower Left – Mary Britni included lots of bath/spa goodies. New lotion, body wash and shampoo (these will live in my travel bag), a pedicure kit, a brand new Essie “Cute as a Button” and a revitalizing eye mask. Lower Right – My favorite part of package was a brand new set of pajamas. You can’t tell from the photo, but the bottoms are shorts which is great for the summer heat here in Columbia. The Mister immediately put them in the wash because he wanted me to wear them that evening. I’m feeling pretty spoiled, and I love my new pajamas! Thanks so much, Mary Britni! And thanks to Angie and Beth for hosting another great swap. Want to see what other goodies were sent in the swap? Click the button at the top of the post or head HERE to check it out. If you didn’t get to join in this swap, don’t fret. 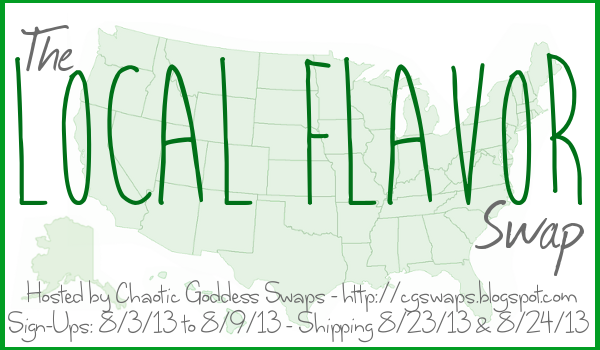 Sign-ups for the August swap at Chaotic Goddess Swaps open tomorrow. This month’s theme is Local Flavors. 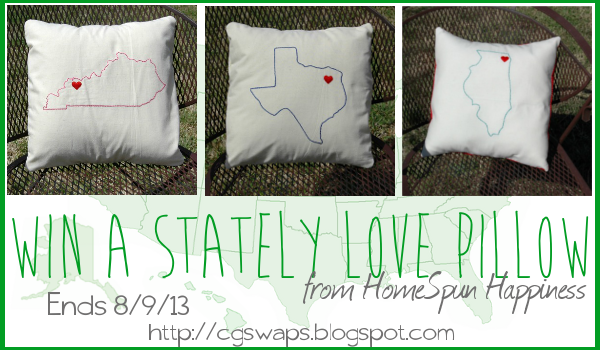 There is a giveaway for a Stately Love pillow being sponsored by Homespun Happiness live right now.